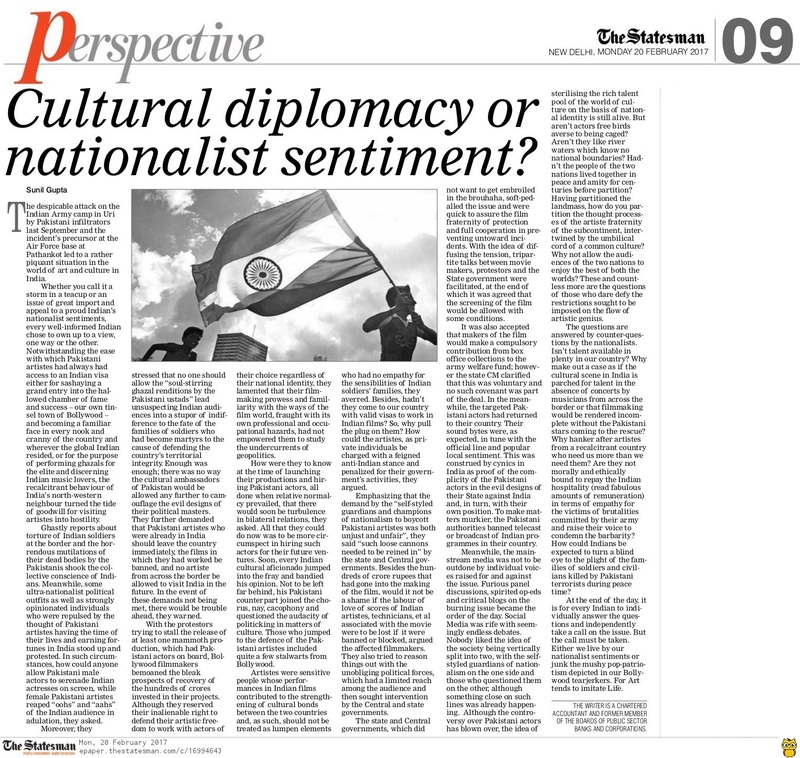 Cultural Diplomacy or Nationalist Sentiment? The despicable attack on the Indian Army camp in Uri by the Pakistani infiltrators last September and the incident’s precursor at the Air Force base at Pathankot led to a rather piquant situation in the world of art and culture in India. Whether you call it a storm in a teacup or an issue of great import and appeal to a proud Indian’s nationalist sentiments and his Bharatiya identity, far from being tempted to go for the easy option of trashing it and moving on, every well-informed Indian chose to own up to a view, one way or the other. Notwithstanding the ease with which Pakistani artistes had always had access to an Indian visa either for sashaying a grand entry into the hallowed chamber of fame and success – our own tinsel town of Bollywood – and becoming a familiar face in every nook and cranny of the country and wherever the global Indian resided, or for the purpose of performing ghazals for the elite and discerning music lovers of the great Indian metropolis, the recalcitrant behaviour of India’s north-western neighbour turned the tide of goodwill for the visiting artistes prevalent at the best of times among the Indian audience into hostility. Ghastly reports about the torturing of the Indian soldiers at the border and the horrendous mutilations of their dead bodies by the enemy soldiers shook the collective conscience of Indians as a whole. Meanwhile, some ultra-nationalist political outfits as well as strongly opinionated individuals among us who genuinely felt averse to the idea of the Pakistani artistes having the time of their life and fortune made on the Indian soil while their own country was flagrantly pursuing its policy of trying to bleed India by a thousand cuts, stood up and protested. In such circumstances, how anyone could allow the Pakistani male actors serenade the Indian dream girls albeit on the screen, and the female Pak starlets reap the “oohs” and “aahs” of the Indian audience in adulation, they asked. Moreover, they stressed that no one should dream of allowing the “soul-stirring ghazal renditions by the Pakistani ustads” lead the unsuspecting Indian audience to a stupor of indifference to the fate of the families of our soldiers who had become martyrs to the cause of defending the country’s territorial integrity. Enough was enough; there was no way the cultural ambassadors of the enemy country would be allowed any further to camouflage and overwhelm the evil designs of their political masters. They further demanded that Pakistani artistes who were already in India should leave the country immediately, the films in which they had worked be banned, and no artiste from across the border be allowed to visit India in the future. In the event of these demands not being met, there would be trouble ahead, they warned. With the protestors trying to stall the release of at least one mammoth production, which had Pakistani actors on board, Bollywood filmmakers bemoaned the bleak prospects of recovery of the hundreds of crores invested in their projects. Although they reserved their inalienable right to defend their artistic freedom to work with the actors of their choice regardless of their national identity, they lamented that their filmmaking prowess and familiarity with the ways of the film world, fraught with its own professional and occupational hazards, had not empowered them to study the undercurrents of geopolitics. How were they to know at the time of launching their productions and hiring the Pakistani actors, which were all done when relative normalcy prevailed, that there would soon be turbulence in the bilateral relations, they asked. All that they could do now was to be more circumspect in hiring the actors for their future ventures. Soon, every Indian cultural aficionado jumped into the fray and bandied about his two-cents worth opinion. Not to be left far behind, his Pakistani counterpart joined the chorus, nay, cacophony and questioned the audacity of politicking in matters of culture. Those who jumped to the defence of the Pakistani artistes included quite a few stalwarts from Bollywood. Artistes were sensitive people whose performances in Indian films contributed to the strengthening of the cultural bonds between the two countries and, as such, should not be treated as lumpen elements who had no empathy for the sensibilities of the Indian soldiers’ family, they averred. Besides, hadn’t they come to our country with valid visas to work in Indian films? So, why pull out the plug on them? How could the artistes, as private individuals be charged with a feigned anti-Indian stance and penalized for their government’s activities, they argued. Emphasizing that the demand by the “self-styled guardians and champions of nationalism to boycott the Pakistani artistes was both unjust and unfair”, they said “such loose cannons needed to be reined in” by the state and Central governments. Aside from the hundreds of crores that had gone into the making of the film, would it not be a shame if the labour of love of scores of Indian artistes, technicians, et al associated with the movie be lost if it were banned or blocked, thus argued the affected filmmakers. They also first tried to reason out with the unobliging political forces, which had a limited reach among the audience and then sought intervention by the Central and state governments. The state and Central governments, which did not want to get embroiled in the brouhaha, soft-pedalled the issue and were quick to assure the film fraternity of protection and full cooperation in averting any untoward incident. With the idea of diffusing the tension, a tripartite talk between the movie makers, protestors and the State government was facilitated, at the end of which it was agreed that the screening of the film would be allowed with some conditions met. It was also alleged that the makers of the film would make a compulsory contribution from box office collections to army welfare fund; however the state CM clarified that this was voluntary and no such covenant was part of the deal. In the meanwhile, the targeted Pakistani actors had returned to their country. Their sound bytes were, as expected, in tune with the official line and popular local sentiments. This was construed by the cynics in India as enough proof for the complicity of the Pakistani actors in the evil designs of their State against India and, in turn, with their own position. To make matters murkier, the Pakistani authorities banned any further telecast or broadcast of Indian programs in their country. Meanwhile, the mainstream media (MSM) was not to be outdone by individual voices raised for and against the issue. Furious panel discussions, spirited op-eds and critical blogs on the burning issue became the topic of the day. The Social Media was rife with seemingly endless rounds of debates. Nobody liked the idea of the society being vertically split into two, with the self-styled guardians of nationalism on the one side and those who questioned them on the other, although something close on such lines was already happening. Although the controversy over the Pakistani actors has blown over, the wisdom of sterilizing the rich talent pool of the world of culture on the basis of national identity still goes on like a subterranean current of a dried up river. Aren’t actors free birds averse to being caged? Aren’t they like river waters which know no national boundaries? Haven’t the people of the two nations lived together in peace and amity for centuries before the partition? Having partitioned the landmass, how do you partition the thought processes of the artiste fraternity of the subcontinent, intertwined by the umbilical cord of a common culture? Why not allow the audiences of the two nations enjoy the best of both the worlds? These and countless more are the questions of those who dare defy the restrictions sought to be imposed on the flow of artistic geniuses. The questions are answered by counter-questions by the defenders of the nationalist sentiments. Isn’t talent available in plenty in our country? Why make out a case as if the cultural scene in India is parched for talent in the absence of concerts by musicians from across the border or that filmmaking would be rendered incomplete without the Pakistani stars coming to the rescue? Why hanker after the artistes from a recalcitrant and cantankerous country who need us more than we need them? Are they not morally and ethically bound to repay the Indian hospitality (read fabulous amounts of remuneration) in terms of empathy for the victims of brutalities committed by their army and raise their voice to condemn the barbarity? How could Indians be expected to turn a blind eye to the plight of the families of soldiers and civilians killed by Pakistani terrorists during peace time? At the end of the day, it is for every Indian to individually answer the questions and independently take a call on the issue. Either we live by our nationalist sentiments or junk the mushy pop-patriotism depicted in our Bollywood tearjerkers. For Art tends to imitate Life. This entry was posted in blog on February 20, 2017 by admin. Not right to blackmail our producers if they hired Pak actors when relations were normal. Even we indulge with Pakistan in sporting events then why not collaborate in films. Great piece of article Sir …. Only one political party had created a ruckus over release of films with actors from Pakistan. That one politician has no hold in electoral landscape of India so he comes up with patriotic and homeland issues. A pakistani singer got Indian citizenship and said he was proud of that, while others from his country never condemn terror attacks in India, then why should they be welcomed here? On one hand Indian army is conducting surgical strikes and risking lives on border, on the other hand our producers are engaging Pakistani actors, what a shame for country. Ever since Modi has become prime minister, unlawful elements have taken law and order for granted in name of nationalism. It is right that art should see no borders but when you get terror attacks and conspiracies from across the border you must cut off all ties, be it arts or other cultural exchanges. While there are thousands of Indian artists strugglish to make a name in film industry, our producers are relying on pakistanis. This is so discouraging for domestic talent. You get what you give and this is same with our ever-naughty neighbour that has given us nothing but terror. It would be good if no Pakistani is given visa for commercial interests in India. The film paid the price as it was a box office flop. People’s sentiments are in favour of nationalism and our army that is a representative of our valour and strength. It was a matter of shame that West Bengal’s CM hosted Ghulam Ali for a concert just to appease Muslims of her state and get their votes in her support.